This has got to be one of our personal favorite modifications we've done on our TJ! Check out our install write-up and review on Jeepin.com! Show off your Jeep's engine with ease! 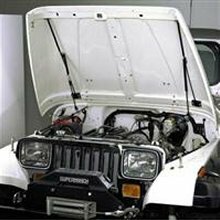 The Hood Lift allows you to open and close your Jeep's hood with just one hand. No more fumbling with the hood brace while also holding the hood. Simply lift the hood a couple of inches and the specially designed gas springs take over and lift the hood to its upright position. The hood will close just as easily by applying only a slight downward pressure. The hood lift installs easily, too (some drilling required). Not recommended for fiberglass bodies.